As you’ll hear, Dr. Merajver – who has been a BCRF Investigator since 2004 – discusses her unique, collaborative and extraordinarily human approach to one of the most significant science questions of our time: How to find new strategies for the prevention and treatment of metastatic breast cancer. And that’s what we’re discussing today – in a way and tone that, frankly, I didn’t fully see coming. Dr. Sofia Merajver is a professor of Internal Medicine and Epidemiology at the University of Michigan, where she is also Scientific Director of the Merajver Breast Cancer Research Program and Director of the Breast and Ovarian Cancer Risk Evaluation Program. This is a view Dr. Merajver clearly held even before going through breast cancer treatment and care herself, an experience, she explains, helped change the vocabulary she uses – the way she talks – with her own patients. And a heads up: You’ll want to hear the very, very end of this podcast and the inspirational way Dr. Merajver ends every conversation with her patients. 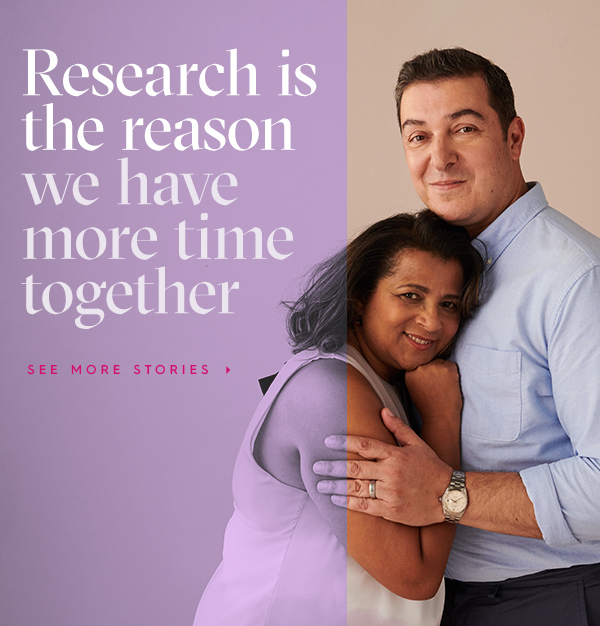 It’s exactly what breast cancer research – and medical care generally – is about. Dr. Merajver, thank you for your time. Dr. Merajver: You're welcome. It's a pleasure to be here. Chris Riback: I didn't have to spend very much time researching about you to get what I think must be a clear sense about the type of scientist and physician you are. In fact, there's one line on your research program webpage that I believe, gives it away, where you write and I'm quoting "We do not turn anyone away, nor do we think any case is hopeless before we start." Does that sum up your core philosophy? Dr. Merajver: Yes, this is definitely operationally how we run it ... how I run it and that is I like to think of a patient as a whole person. A tumor doesn't walk into my office, a whole person walks into my office with everything she or he has experienced in his or her whole life. And they have specific concerns. They have specific goals. They have dreams and aspirations. They've had tragedies. Everything bears into what's going to happen, and we know very little about how to tailor therapies from a biological perspective, to how stressed or how happy or how relaxed somebody is. We don't know how to do that, but we can understand a person. And discuss things with that person about what is likely to happen with different therapies. And how they are likely to cope with it, and who is home with them and bring them to the treatments. And, what are their goals? Is there a special trip they want to take for six months or is there a wedding coming up. These little things are very important to us in our lives and I think to be a good doctor, or at least to try to be as good a doctor as one can be. You need to really give everyone a chance. First of all you can't give up on anybody without knowing about their tumor more or about their biology and also about what's happened to them before. Yes, it has served me well for quite a few years, so I continue to do that. Chris Riback: It certainly has for a number of years and the impact that you've been making. How do patients react to that approach and your level of humanity? Does it surprise them? I'm sure they appreciate it but from what we all have positively and negatively experienced in life. That might not be what they expect immediately from somebody who specializes in internal medicine and epidemiology. Dr. Merajver: Well, I think I try to give the care that I would like for my family members, for myself. When you do it that way, it becomes ... When your job is so close to life or death, then you have a responsibility to give it everything you've got. And not just that part of your brain that remembers facts and figures and names of drugs, and lists of side effects and the shape of cancer cells. But the other part of the brain that puts it all together and tries to predict what's likely to happen to this person, given his or her circumstances today. And that requires knowing the person. Practicing medicine has been nothing but an incredible privilege and pleasure for me and I'm very lucky to have been able to have a career I have and combining a passion for science and to bring it to the patients. It's just an unbelievable privilege and sure, it took some sacrifices, but I don't see them as sacrifices. I see them as just basically what it takes. Chris Riback: That's a wonderful characterization, and I'm sure that your patients feel like ... people who benefit from your research, feel like they are the ones who have gotten the benefit and for whom the privilege is. Let me ask you, if I could about the science because that's the areas in where you are clearly just, and listening to you where you are putting both your heart and your mind ... the science is ... those are the discoveries that you're making. And to understand your work, it's first imperative I believe, to understand metastasis. Before we get into a little bit of the nitty gritty around your studies and the research. How do you explain to people, not only what metastasis is, but why it happens? And why that, in some cases, cancer cells in one part of the body travel to other parts, yet in many other cases this never happens at all? Dr. Merajver: Indeed. Cancer, basically all cancers have with possibly just one exception, a savvy capability of eventually going to distant organs. Some cancers do that more easily than others, and some cancers prefer distant organs over others. The science of metastasis has exploded over the last 40 - 50 years. And we know an awful lot about the individual steps that a cancer cell has to cope with. And it isn't an easy trip. Let me assure you. The amazing thing about cancer is how hard it is for the cell to really make it. And how powerful the adaptions ... how the cancer cell has to constantly change or recruit other cells to help it, cope with a different parts of the body, has to travel through. A tiny cell that is lodged in the breast tissue and it wakes up, saying it was left behind, or it evolved in the breast tissue, because we focus a lot on breast cancer. Not exclusively, but certainly most of our work is on breast cancer, a huge public health problem around the world. We figure we want to tackle, and we want to tackle the most aggressive cancers. The ones that kill proportionately the most women. And a tiny cell is in the breast minding its own business and then there is a constellation of things that need to happen, for it to even begin to move in that little place that it is logged. And then to find the blood vessel ... to get inside the blood vessel. The blood is not good for cancer cells unless this is a leukemia that is a blood cancer. Cancer that arise in organs like prostate and breast and pancreas ... Once they're in the blood, it's a very hostile environment. It's not easy for them to survive. Most of them die there. Lucky for all of us and then our immune system also is able to recognize them more easily once they're in the blood, because a lot of immune cells also circulates through the blood. There is a real war that is being waged every single day in everyone of us. Most of us feel that we have the potential to be developing little tiny cancers throughout our lives pretty much. Most of which don't seem to come and cause us any trouble. Now once the cancer is diagnosed in some organ ... even if it removed and then sometimes chemotherapy or hormonal therapies are given, there may be, even from the beginning, just a small ... we call them clones because they are all very similar to each other. Clone of cells, group of cells that already have the potential to spread. And why do they in some cases and why don't they in some other cases? That is the really holy grail of oncology, in a sense that we all have theories, and we all have very detailed experimental models like I have in my lab and many other scientists ... the BCRF scientists have in their labs. But we don't what I would call from the physics world a unified theory of a cancer cell. We don't have that. We are working towards that to really understand at a very broad ... what we call systemic level. If you take everything into account. The cancer cell then the normal tissue where the cancer cell is right now, and then what else is happening in the body. Is this a patient who also has diabetes? Is this a patient who is also obese? Is this a patient who is eating vegetables? Is this a patient who is smoking? Is he or she drinking too much? Are they seventy? Are they exercising? Are they stressed? Are they poor? Are they constantly concerned about where the next meal comes from? I think if the government shut down goes on for any longer, I think we should take ... we should do. We are missing on opportunity to do a research study on government workers because they are under tremendous stress right now. The prediction would be that they would be some consequences. They may be related to cancer or to other diseases. People under stress don't do well in multiple chronic diseases and cancer is a chronic disease. Chris Riback: It's so interesting to hear you talk about this holistic approach and all the different angles and aspects in which you need to look at it. First of all, it for me, goes back to the beginning of this conversation and how you even just described in your role ... you need to think about all aspects of what's going on with a patient. It also, from what I've read, seems to be how you run your research lab. When your process ... One of the things that you're doing is, you're using devices to study which breast cancer cells can migrate to different tissues. Chris Riback: Your process ... you combine this theoretical view what do the models predict will happen with the actual experiments themselves. And to do this, you bring together Physicists, Electrical Engineers, Biological Chemists, Cell Biologists, Oncologists, more. How do you conduct that kind of orchestra? Dr. Merajver: That's what I love the most. I just have to tell you one minute why, and that is, I decided to be a scientist when I was five years old. This is what I announced to my parents. That's what I was going to be. And, when you're five, what do you know what science is and what do you know about this specialty or that specialty? But I understood that what I was happiest at, is and asking questions and find answers. And if I didn't know the answers to ... research the answers. Dr. Merajver: ... Exactly. Holding something in your hand [inaudible 00:15:20]. It is through that process of wanting to be a scientist from such an early age, where the disciplines mattered very little to me. I was just as interested as knowing what happened to Neanderthals, as I was interested in how to cure cancer. Although I had a very significance with cancer when I was 15 and my father came down with just about the worst kind of lung cancer a person can have. I felt obliged to study a lot about that to see how I could contribute to his treatment. It's crazy for a 15 year old to have those aspirations. But I had already been thinking about science for 10 years by then, so was considering myself as semi expert, which of course pretty ridiculous. But non the less, that is something that has carried me and even though I'm no longer 15, fortunately, I am able to talk to a large number of types of scientists. And just respecting their skills and getting them excited about cancer. Cancer needs all these scientists. And BCRF is basically the only research organization that respects that importance of bringing engineers and quantitative scientists in really multi-disciplinary, constantly experiencing the cancer phenomenon. Take example artificial intelligence. For example, we are using artificial intelligence in our lab and to figure out which cancer cells are going to go into the brain. That's a question that's never been tackled. If you had a small tumor. Nobody thinks of brain metastasis, but I do because I know a certain number of those little tumors will show up in the brain and they will carry the day for that patient. The brain metastasis is a very serious metastatic event and people can survive it. A certain number of weeks to months, even sometimes years. But it is rare. The years is very rare, whereas metastasis is other sites, people can survive many years, especially from breast or prostate cancer and so on. But brain metastasis have a certain way of attacking who we are because obviously our personality and our feelings and our identity resides in our brain. Brain metastasis are especially something I really have a specific penchant for trying to beat and this is something that worried me before I was a hysician. And once I was able to invent a way to take a small tumor and then see if there is some physical phenomenon about the cells because the blood brain barrier is a true barrier. The whole country now is involved in a barrier question, right? And we have barrier. Until I started studying biology, we know a lot about barriers. And there are leaky barriers, there are semi leaky barriers and there are real impossible barriers. The blood brain barrier can become a leaky barrier especially for certain cancer cells. But the question was never asked. And I just can't stand questions that are never asked, and I built this whole system, funded by VCRF to try to see how the cells go through, but then once I had the system going, which of course the Engineers building it with me ... They will realize that "Hey, in order to understand this, the cells are so different one from the other, even though they come from the same person ... we need artificial intelligence to try to figure out that they are too big." If we look at 200,000 cells and each one is a separate experiment, then you need different methodologies in mathematics to really try to predict how do you really separate the ones that will go through from the ones that won't. We had to use machine learning like the same thing that's used to predict the weather and so on, which are incredibly large data set and the motion of stars and planets in the distant galaxies. That's the kind of mathematics we're using to predict what's going to go in the brain. But I'm not scared by any of this. I know math is good, and I have a PHD in Physics, but I am not the one doing all the machine learning. I couldn't do it either ... I'm not trained in that, but I can talk to other scientists and so we do have now, the capability for the first time in being able to predict by the shape and the behaviors of certain cells, whether they are likely to go into the brain. And that's ... starting with a paper that's being reviewed right now, and it took about four years. You have to be willing to have a bit of a dry spell for that question so other things in your laboratory have to be producing papers and results because in most scientific laboratories you can't four years without a publication, or they'll think you are a complete failure. Of course in the olden days, very famous scientists sometimes did go several years but that's not the pace of biology research today. When you talk about managing the orchestra, a lot of what I do is to steer the projects and manage the funding so that we don't run out of money for any of the projects, and that they are all producing results are a fast clip to keep up with the pace of science today. Chris Riback: That makes a ton of sense, and it also makes me think "Well in the old days we all used to read documents longer than a 140 characters in length." Whatever you can bring back from the past would be terrific. I keep listening to you and the journey and the difficulty, and to use your word, the barriers around the movement of cancer cells from one location to another. You talked about the trouble of traveling through the blood except leukemia, cancer, and the challenges of metastasis in a cancer cell moving into the brain and yet we know it happens. The predictive nature and that's at the heart of so much of what you do. Where would you say you are ... where would you say we are ... what do you day to patients around "Here is what I'm looking at as I think about predicting." I'm not in the predicting business." You might also say, but when I think about what might happen around metastasis. What do you know about predicting when and how metastasis can occur? Dr. Merajver: For an individual patient who doesn't have metastasis yet, the tools we use in the clinic are not quite obviously as complete and extensive as the tools we use in the laboratory. That's going to take a while to have a trajectory from the lab to the clinic, in a formal way. We have a trajectory from the clinic to the lab in that we collect tissues from patients, and we do all this research, and then we refine these predictors and then we test them in the real world. We're in the process of doing that next step, which is to test them in the real world in terms of over a broad range of patients, can we predict what their likely metastatic trajectory is going to be. But I tell you something ... we are really exciting, which is really getting very close to the clinic. A few years ago I decided that I was very satisfied with the idea, that when we take a biopsy from a patient ... if the biopsy is sequenced that means the DNA is studied, and we find out the gene changes that that tumor has undergone. A large number of labs including a very well known lab here at the University of Michigan has been doing that, and they recommend then drugs for patients. That was very unsatisfying to me in the sense that I thought this is a great first step, but in my mind I predicted that there would often be lists of drugs and how would the patient underactive, would choose what drug to actually give the patient. We set out, also with help from BCRF ... we set out to build a whole platform, where we can take biopsies from the patients and test them for drugs in the laboratory in a manner that is consistent, rigorous reproducible. All these important things that need to happen in a scientifically rigorous laboratory because this hasn't been attempted before, and the oncology has a very bad taste about drug testing of tumors because there were many companies that were reporting to be doing that. They were not doing it correctly partly because they didn't know but then they shouldn't have been going commercial with that, but non the less that happened and some of my teachers in oncology would tell me it would never be possible. But I never believed that because we are very advanced ways to culture cells directly from the patient. We are very excited that now we can actually test 20, 30, 40 drugs in a matter of days after a patient has a biopsy. Then in addition to the drugs suggested by those studies that sequenced the DNA, which are incredibly useful, we are then able to perhaps in the near future be able to produce priorities. Patient is now going to take 20 drugs in succession and the question is "What about combining two drugs?" Which two should you combine and why? We have the capability of testing combinations, testing single drugs and I believe that what I'm going to put the most effort in my lab in the next five years, to get to the point that we can work alongside those tests that are called genomic tests and be able to really help Doctors and patients. Say "OK, your tumor can be killed by these five different drugs and these are the spectrum of side effects of these five drugs." And then they have something to discuss in the examining room. They have something to discuss about choices, because right now we are pretty much guessing or they are opportunistic matches. If somebody has a mutation in a given gene and there happens to be a clinical trial open to a drug that may be related to that gene, then the patient gets put on that trial. There's nothing wrong with that because that's the best we can do now. But think we can do better. We need to do better because we are only benefiting about two to five percent of the patients who are sequenced right now. And that's too low. We need to get to 80%. I want to get to 80, 90% in the next five to 10 years. I think we can be there. Then in that landscape, working with many other Centers, I think we are looking at a horizon where in about 10 years, I think 80% of patients with metastasis can look forward to living years. I think that's the goal that is achievable. If we put funding into this and if we work together. It's a combination of things. It's not going to be just one lab doing everything. Chris Riback: Well, that certainly would be remarkable and no surprise that your mind is working in ways to bring together an orchestra of research labs, as opposed to just thinking that one instrument could do it all. Chris Riback: I want to ask about you a little more as well. You spoke about this publicly. You are not just a breast cancer scientist and physician. You're also a patient. Chris Riback: Does clinical and scientific experience and how does clinical and scientific experience apply to one's personal life when the one of the diseases that you've studied your whole life, you end up getting as well? Dr. Merajver: Yes, that's a bit of a detour on the road isn't it? I'm shopping for shoes on Michigan Avenue, Chicago visiting one of my daughters and from the time I chose the shoes until the time I paid for the shoes, I had cancer in both breasts. That was just really not right. Anyway, that was a very unusual day and I'm incredibly fortunate. I have an incredibly supportive family and the hardest thing for me, was to tell my daughter who was right there. There was no way to fake it and then tell it under other circumstances. It was right there at their store on Michigan Avenue. I'll never forget it but so she started crying, and it was very sad for me to see her so sad but it's an early stage and like all early stages, some have better biology than others. This is what I've done all my life. I know my biology, and it is what it is, and I have the best care here are the University of Michigan. Just unbelievable care. For me, the experience as a patient has been extraordinary, and I hope every single patient we see here, has exactly the same experience. I also need to point out that I absolutely forbid my friends for doing anything out of the ordinary for me. They were offering this and that and I said "No, I want to see you when you have clinic." "Oh, I'll see you on Saturday." "No, no, I want to come on the regular clinic day." I don't want to tall through the cracks because you are doing things out of the ordinary. Even though I'm a Doctor here and I've been here for many decades, I've got the same care anyone gets because I like that idea. I like the system. I like to get the care that every patient gets. That's just a bit of advice to any listeners out there who are thinking "Well I can't get good care because I'm not a VIP." Don't try to be a VIP. Just make sure your Doctor cares about you and that you're connected to the clinic. You know the office number. You have a nurse or a scheduler at the clinic who's navigating your case and you keep all your appointments. And bring a family member of a friend to take notes with you and so on. Just do ... just take care of yourself and the systems in America are good to cure patients who are aware more or less of the steps. I went through all the steps for treatment and I really missed a week of work because I just tele-conferenced from my lazy-boy and I won't let cancer define my life. It's something that happened to me, but on everyday I am happening to cancer. I'm beating back cancer in all of my patients and I'm helping my colleagues do the same. I figure cancer got a week out of my life so far and made a bunch of the people I love the most very unhappy and I don't get that a lot, but other that I recovered that week. Chris Riback: That's terrific and yes, you've recovered that week. You've given it on to others. Interesting to hear. Anything about your experience of going through that care as a patient? Did you change or alter anything about the care that you give or did it instead maybe validate to yourself "Okay, you know what I'm doing this okay. I'm giving exactly the type of care that I would expect to have gotten myself." Was there anything that you learned by going through it, that altered the way you approach patients? Dr. Merajver: Yes. All of medicine in a way are conversations that we have with our patients and their family. Right? We practice medicine through conversations. People think that we practice medicine with the electronic medical records. Forget that. That's just an accent of history. What we do is, use our brain to help people. It's what medicine is all about. And to conversations ... to pro's and con's and to reasoning things and to helping people find their path. What my experience gave me and I've always taken pride as a physician in thinking when I'm not in front of a patient. When I'm by myself thinking of a life and what I do, I like to think of ways to say things to people. What words should I use, and I have trained myself to use certain words or certain comparisons to explain cancer and cancer therapy to people. In general, in the community and when I teach to my students ... when I teach at the website and then to my patients when I treat them. What it did for me, is it added to my vocabulary. When I experienced bilateral mastectomies as a patient, it incredibly added to my vocabulary. When I describe bilateral mastectomies to my patients and I do that very often. A lot of my patients undergo bilateral mastectomies. Now that I have been a patient in that situation, I do have different words, different things I say. When I treat them with a drugs I'm taking, then I'm able to say other things. Some patients, they're close enough and I've known them long enough. But they know that I don't necessarily bring up. They don't know why I'm describing things in great detail. Some of them know but most of them don't. But I feel that it does help me get closer in those parts of the treatment that I have experienced. Dr. Merajver: ... So important. Dr. Merajver: ... What you say can not be unsaid. To think about the words is super important I think. Chris Riback: To close out this conversation and words that I could keep listening to from you for a very long time. It's a terrific and the way that you approach everything, just all comes together. You can really feel it. You've touched on this already. The BCRF and the role that they've played in your research. How would you characterize that? Dr. Merajver: Well, life's changing. I would still be doing research if I didn't have a BCRF funding but all of the great breakthroughs that I've hoped for in my career, were accelerated and in some cases, completely made possible. It sounds so tremendously. My contributions to humanity which is the whole point of the work I do. I don't know what else to say, but to say it's transformational. A transformation I respect because not just the dollars. The dollars are certainly an important part of it. For the listeners out there, the funding is unbelievably important. But the other part is the collaborations. It's the whole group of scientists from around the world thinking in different ways and comparing ideas. It's just an amazing community and I have learned so much from them. Chris Riback: Around the world really matters to you doesn't it. Dr. Merajver: Oh for sure. Chris Riback: Very quickly, you're doing remarkable work not just in the United States, but truly all over the world including Africa. Yes, we are definitely very interested in continuing our work in Africa and we are studying African samples in our lab, and we have trained African Researchers in our lab, who are practicing in different countries. I am very committed to global cancer cells and I will continue to do the best I can. I think we need to enhance, take care of women around the world and there are not a lot of us in the United States working on this and if we continue, it's difficult with the funding. It's expensive. Things cost a lot more if you have to spend twenty thousand dollars traveling back and forth, and sending samples and buying equipment in another country and things like that. But we manage to make at least some progress. So, yes we are here to create cures for everyone. Chris Riback: Dr. Merajver, thank you. Thank you for your time and of course, most importantly for the work and care that you've given to people all over the world. Chris Riback: “To life!” Thank you. Chris Riback: That was my conversation with Dr. Merajver. My thanks to Dr. Merajver for joining and you for listening. To learn more about breast cancer research or to subscribe to our podcast, to bcrf.org/podcasts.